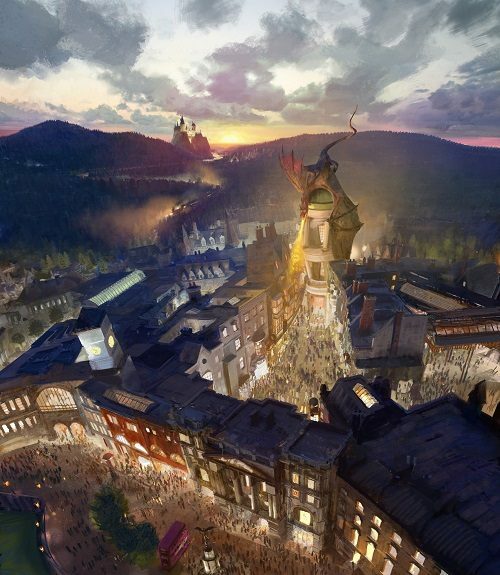 ORLANDO, Florida -- Universal Orlando Resort and Warner Bros. Entertainment announced the planned addition of Diagon Alley to The Wizarding World of Harry Potter that will span across both Universal Orlando theme parks. Scheduled to open in 2014, the new area will bring to life some of the experiences and places found in and around London in the Harry Potter books and films, offering brand-new adventures for Potter fans and theme park guests from around the world. Diagon Alley and ‘London’ will be located within the Universal Studios Florida theme park, which is adjacent to Universal’s Islands of Adventure theme park, where guests now experience Hogwarts and Hogsmeade. And – just like in the books and films – guests will be able to travel between ‘London’ and Hogsmeade aboard the Hogwarts Express.